Download the table of the dynamic UPS range. The dynamic Cat® UPS system are delivered as a compact system that can be installed as you wish, central with your power supply of decentral with your sensitive machinery. The power per UPS system varies from 250 to 1,000 kVA. When more power or redundance is necessary, we can connect multiply units in parallel to a maximum of 7,000 kVA. The energy is saved in the form of kinetic energie in a flywheel. In normal operation, the power grid feeds the connected loads directly thourgh the UPS system. In case of a grid outage or any irregularity on one of the phases, the UPS disconnects immedeately from the grid while the flywheel(s) continu to feed the connected loads without any interruption. The CAT UPS system can support 100% load for a minimum of 15 seconds (in more than 92% of the irregularities of the belgian grid, it stabilises again within 1 second). When the grid returns with an acceptable quality within this period, the CAT UPS will resynchronise and transfer graduately the load back to the grid. Once the load has been tranferred to the grid, the flywheel of the UPS system will act again as a motor again and picks up speed (and energy) to recharge to its nominal 7,700 rpm. In the majority of applications, the CAT UPS is installed in combination with an emergency generator. In this case the no-break autonomy is unlimited. Due to the “Continuous Power Sequence”, the emergency diesel generator will be started 1 second (programmable) after the grid outage. The Continuous Power Module (CPM) of Caterpillar is a “Plug and Play”-system that is specially designed for locations where a compact solution, outside the building, is required. 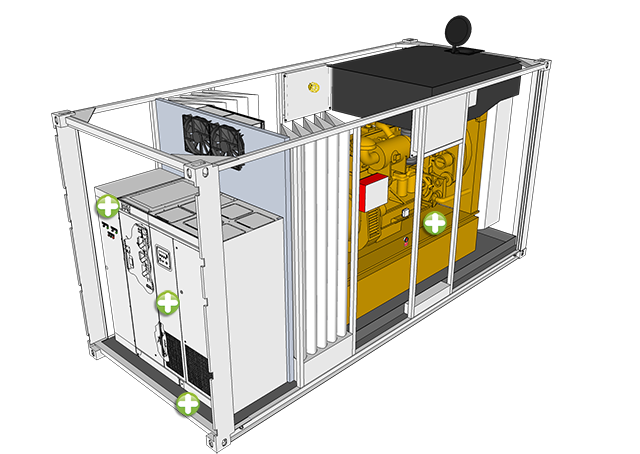 A CPM that is built as a container includes the emergency generator, the UPS system and the necessary switchgear to make this work as a total autonomous system. It is sufficient to connect the grids arrival and departure to the user to protect. CPM units can be supplied with a UPS from 250 to 1,000 kVA.